October 2016: Scenes of disturbance at a polling station in Jikhashkari village in the southern district of Marneuli. Image: Luka Pertaia / Netgazeti. Just before midnight on 8 October 2016, the day of the parliamentary elections, a group of men stormed into a polling station in Jikhashkari, a village in Western Georgia. The station was closed for the counting of votes, but the attackers were able to get past the police guards and into the polling station. There were at least four police officers present in and around the station, while other units were nearby. 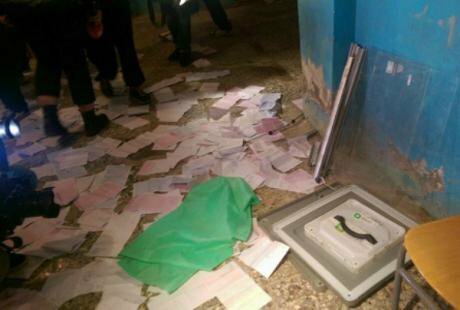 The attackers threw ballots and papers around, disregarding the protests of the polling station commission. They disrupted the vote tabulation, in a manner that resulted in the annulment of the elections at that precinct, and acted in an intimidating and threatening manner. Then they turned their attention on three international election observers who were present. We’ve had the privilege of working closely with Georgian civil society organisations for the last 15 years. While these years have been marked by disturbing and dramatic events, such as the war in August 2008, there has also been progress in some important areas, such as freedom of expression and access to effective courts of law. While relations with neighbouring Russia remain strained, relations with Europe have improved to the extent that Georgians now travel visa free to the EU. There are many reasons for these developments, but key has been the willingness of the people to participate in public affairs and express their opinions through elections that have generally become more free and fair over the last 15 years. In the Caucasus region, free and fair elections do not come about by themselves. They are hard-fought achievements. Georgian civil society and key human rights institutions have worked with Parliament, the Central Electoral Commission and the media to protect the right to vote. In this, they have been supported by international election observers. In 2016 the Norwegian Helsinki Committee together with the European Platform for Democratic Elections, International Partnership for Human Rights and the International Electoral Studies’ Center observed the parliamentary elections. We focused on regions that had previously experienced irregularities and violence in connection with elections. Three of our teams went to Western Georgia. Specifically we chose to observe in the district (#66) where Sandra Roelofs ran as the candidate of the United National Movement (UNM), the main opposition party. Ms. Roelofs is married to Mikheil Saakashvili, Georgia’s former president who fled the country after facing charges relating to corruption and abuse of power. It seemed to us that this seat was a prestigious prize and that the local authorities perhaps would like to avoid a second round of voting, which would indicate the Ms. Roelofs, Mr. Saakashvili and the UNM still have support. After tip off’s about possible trouble in Jikhashkari, one of our teams went there to observe the count. At one point during the count, the sizeable pile of ballots for Ms. Roelofs suggested that the ruling party candidate would not gain an outright victory in the first round at that precinct. Just afterwards a number of election commission members left the premises, and the attackers entered. Election observation is an important democratic institution that is protected by Georgian law and international organizations that count Georgia as a member. Yet the police in Jikhashkari did not intervene when our three observers were attacked. Two of the observers had their mobile phones taken (they had filmed the altercation in the polling station), two were physically attacked and one female observer from Russia sustained light injuries. The incident was covered in Georgian media. Various Georgian and international bodies protested. The authorities opened a criminal investigation and an administrative inquiry into the conduct of the police. The NHC followed the processes, wrote letters and had meetings with the Ministry of Internal Affairs on many levels and the Office of the Prosecutor. Our aim was to ensure that case was properly investigated. A year later, and on the eve of local elections, it is perhaps useful to sum up how the incident was dealt with. The administrative case launched by the General Inspectorate of Georgia’s Interior Ministry resulted in the reprimanding of two officers who were found to have neglected their duties. In two separate cases in May and June, two men were convicted of attacking our observers and given conditional sentences. Throughout the year, Georgian authorities answered all our queries promptly and convincingly declared that such an incident should not happen again and that election observers should feel safe in Georgia. The administrative actions taken against the two policemen and the conviction of two of the attackers are evidence that the justice and police authorities recognised that a crime had taken place and that actions were taken to punish some of those who were responsible. Yet we are also left with a number of unanswered questions. It is difficult to understand why the identity of the other attackers have not been established. Jikhashkari is a small village, yet even the policeman present during the attack was unable to identify any of the other attackers. There is no explanation as to why why the police failed to contact reinforcements stationed on the outskirts of the village. Individuals who witnesses reported to have been part of the group of attackers were apparently not questioned during the investigation. There is no mentioning of a motive for the attack. Local witnesses, interviewed by us, claimed that the commission members were warned about the attack beforehand, but instead of locking the doors, they left the building. They believe that the commission members and the police colluded with the attackers, in the sense that they did not intervene to stop the attack, and that there may have been an order to disrupt the vote count in Jikhashkari and annul the results there. The incident in Polling Station 79 does not appear to have been linked by the investigators to the identical attack on the other polling station (108) in the village, which took place at the same time and presumably involved the same group of perpetrators. Indeed even the cases against the two individuals who were charged with attacking Polling Station 79 and our observers, were investigated and tried separately. Our feeling is that Georgian police and justice authorities have refrained from a full-fledged investigation into the aims and organisation of the attack, and settled for a “compromise solution” where a few individuals are punished, administratively and by the courts. We are left wondering: If it was a premeditated attack, as circumstances seem to suggest, who planned and ordered it? We will anyway return as election observers in order to strengthen democratic institutions and cooperate with Georgia’s vibrant civil society. We trust that Georgian authorities will do their utmost to protect the institution of international observers in the future. In many respects Georgia is way ahead of the neighbuoring states with regard to human rights and democratic standards. Still, the lesson from Jikhashkari seems to be that some of the practices from previous Georgian regimes have survived despite the many improvements that have taken place.